Prints of all the images on this Site can be reproduced. Images of prints are virtually identical with the original. 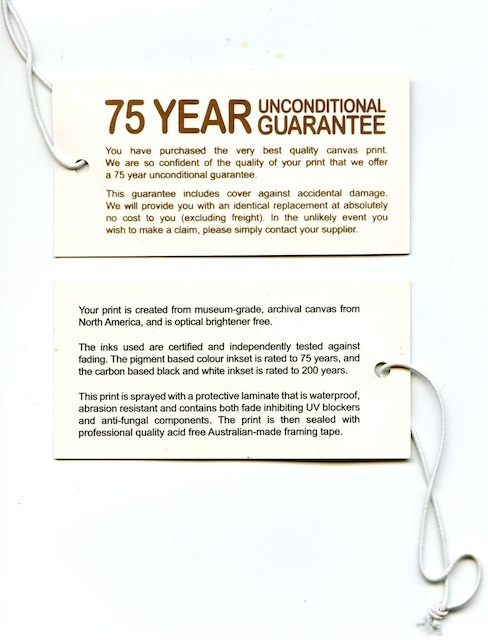 Supplier (Printer) provides a 75 year unconditional guarantee. See details below. Proofs of the original are checked by the Artist before the final print run and delivery. Printing can be done on Watercolour paper (acid free) or Fine Art Canvas, either ready to stretch and frame, or to hang. Prices depend on size but are typically less than $400 for a 40" x 30" image (plus shipping). Giclee, pronounced "zhee-clay" is a sophisticated inkjet printing method. It merges the use of professional grade large format printers with archival pigmented inks, archival watercolor papers and canvas. By using custom profiles, these printers can render subtle gradations and many colors that would be out of range with other technologies. Giclée combines the beauty and brilliance of this printing technology with the use of pigments and the variety in paper types from canvas to watercolor or satin papers. A giclée print on canvas, or watercolor paper will make photos and paintings jump out with deep blacks, saturation and gradations hard to achieve with other media. Giclee prints are bought and sold in auctions worldwide. The concept is not new: artists made etchings on copper (plates) and would make limited editions on paper centuries ago. Numerous examples of giclee prints can be found in international galleries. Limited edition prints, signed and dated by the artist are generally more valuable to art buyers for the obvious reasons of limited supply.